Marrowfat processed peas in water, with sugar, salt and colours added. 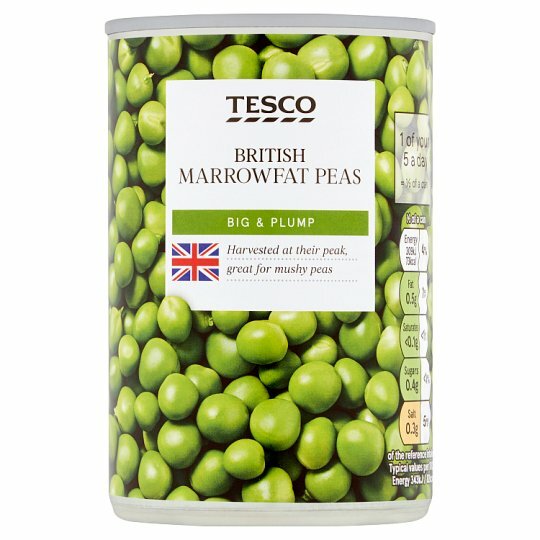 INGREDIENTS: Marrowfat Processed Peas, Water, Sugar, Salt, Colours (Copper Chlorophyllin Complex, Carotenes), Natural Mint Flavour. Store in a cool dry place., Once opened transfer unused contents into a non-metallic container, cover and refrigerate., Consume within 2 days. Empty the contents into a non-metallic bowl, ensuring water covers beans and cover. Heat on full power for 2 minutes (800W) 1 minute 30 seconds (900W). Stir, then heat on full power for another 1 minute (800W/900W). Stir well and drain before serving.